Earlier, BCCI had made an announcement that the 2019 IPL finals will be held at the MA Chidambaram Stadium, and also released fixtures for the second part of the tournament that will take place till the 5th of May. Chennai Super Kings is a team that everyone enjoys watching irrespective of their interest towards cricket in general. 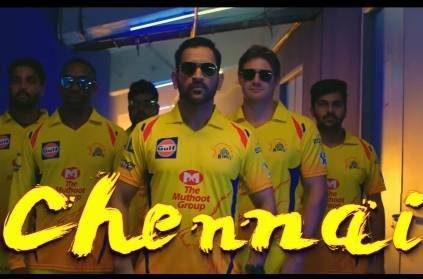 CSK also enjoys such a loyal fan base in the form of the Whistle Podu Army who are prepared to travel across the country to watch their team play. Here, for the fans, is a list of Dates and venues for all CSK matches till May 5. So, let’s block out dates and cheer our team all the way to Victory!!! 'லேட்டா வந்தாலும்...பேட்ஸ்மேன்களை ஓட விட்டவர்'...ஓய்வு அறிவிப்பால் ரசிகர்கள் அதிர்ச்சி! 'உங்கள நம்புனதுக்கு நல்லா வெச்சு செஞ்சிட்டீங்க'...பேசாம ரெஸ்ட் எடுங்க...கடுப்பில் ரசிகர்கள்! ‘குரு தோனியை கூலாக இருக்க விடமாட்டேன்’ என்று சொன்ன வீரருக்கு பேட்ட ஸ்டைலில் CSK பதில்! This page contains news relating to various facts and events. The views are generally about current affiars and general topics in diversified areas such as political, international, national, and regional issues, sports, health, travel, lifestyle, technology and business. People having similar interets on the above topics will find this page useful. Dates and venue for CSK games | Sports News.